Description: For sale: One (1) new in box CZ Custom Shop CZ SP-01 Shadow Orange, 9mm. 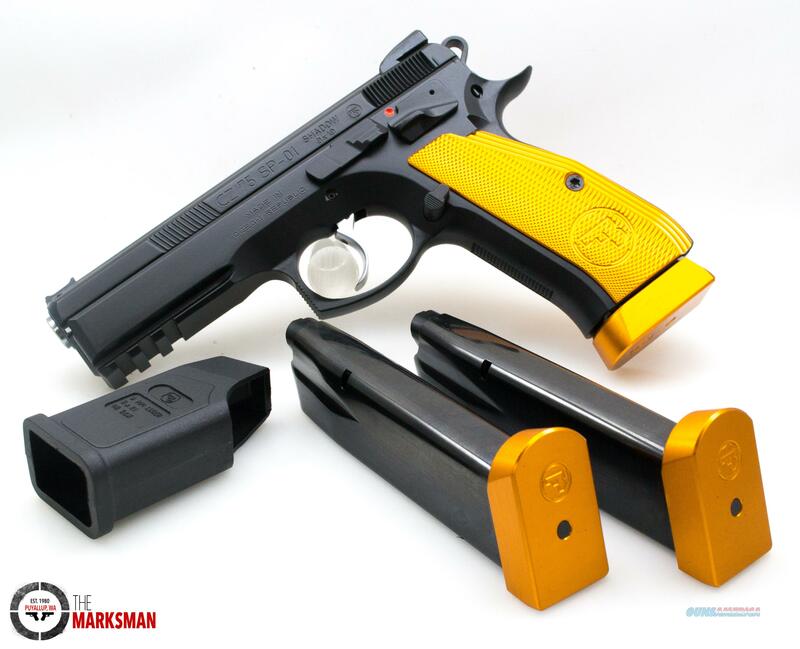 This pistol comes with three 18 round magazines with orange aluminum base pads, 4 5/8 inch barrel, orange aluminum grips, fiber optic front sight, black blade rear sight, ambidextrous manual safety, CZ Custom Shop tuned double action/single action trigger, short reset disconnector, the ghost hammer, extended magazine release and comes in a factory plastic case with the factory paperwork, test target and cleaning gear. From the factory, the barrel and recoil guide rod have been polished, the barrel and slide hand fitted and this pistol comes with a recoil spring set, a main spring set and a buffer set to tune this handgun to your loads and preferences.